Discover Leonardo 's world, life, works and not-yet-fully-revealed secrets! The World of Leonardo Exhibition is one of the most important events of the year. This Exhibit is not to be missed. The discovery of Leonardo da Vinci, the artist and inventor, with working models of his machines and digitalized restorations of his paintings, a worldwide first. 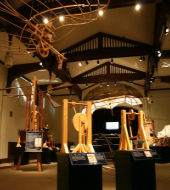 In the main room of the museum there are more than 40 machines, built to scale following Leonardo’s plans. He was so extraordinarily ahead of his time! To think that if these machines had actually been built at the time when they were invented, they would have revolutionised the history of art as we know it. Each machine is accompanied by explanatory notes translated into 6 languages, and the room is equipped with multimedia devices. In this room you will find reproductions of Leonardo’s most famous paintings. The Last Supper, the Mona Lisa and the Annunciation: works that are characterised by an extraordinary harmonic composition and by an aura of mystery, and have had an enormous influence on successive generations of artists. His paintings exist in a hall of mirrors, in a paradoxical shrine. They depict not only physical appearances, but for the first time, also intrigue, feelings and states of mind. During his life, Leonardo wrote and drew thousands of pages of notes on the human body. He wanted to understand how it was made and how it worked...muscles, tendons, skeleton, heart, arms and other organs. In this room, you can watch the screening of a video mapping anatomical studies onto a model of the human body, in order to understand how prospective was discovered, and rediscover classical sculpture and the development of new painting techniques. Opening hours: Everyday from 9,30 am up to 10,30 pm.